Distek Inc. has developed a benchtop scale single-use bioreactor (SUB) system for mammalian cell growth and recombinant protein production. The pre-sterilized BIOne system is engineered with a disposable headplate welded to a triple-layered liner that can be easily inserted into a non-sterile bioreactor glass vessel, converting it to a sterile, disposable SUB within a matter of seconds. Upon media addition, the liner expands and moulds to the glass vessel, preserving the geometry of the existing bioreactor. The Distek BIOne system significantly reduces turnaround time by allowing users to seamlessly transition to a disposable platform while utilising their existing capital equipment, without compromising the scalability of their current process. Broadley-James Ltd is the preferred supplier of the BIOne for the UK and Ireland, follow this link for more information. turn-around time between runs. 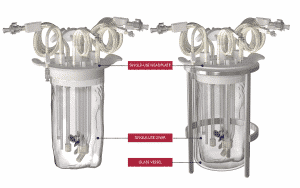 Simply unpack the BIOne Single Use Benchtop Bioreactor System, place it into your glass vessel, insert your probes and you’re ready to batch and inoculate! The BIOne Single Use Benchtop Bioreactor system is compatible with most manufacturers’ glass vessels including: Applikon, Sartorius, Broadley-James, Finesse, Infors and more. You don’t need to make a large capital investment to convert your existing benchtop glass bioreactor to a single-use bioreactor. Simply remove your existing headplate and place the preassembled and sterile Distek BIOne System into the glass vessel. The “patent pending” bioreactor liner will mould to and mimic your existing glass system allowing you to continue using your existing controller, sensors, motor, heating jacket and recipes. Since the liner is identical to the dimensions and aspect ratio of your existing vessel, there is no need to change your process. All materials are USP Class VI, animal derivative free and utilised in existing single-use products. THE SIMPLEST SINGLE-USE BENCHTOP BIOREACTOR SYSTEM ON THE MARKET TODAY!